2012 Sunseeker Manhattan 63 lying in Mauritius. This Sunseeker Manhattan 63 benefits from a excellent specification including; Hydraulic bathing platform, tropical air conditioning, Kohler generator, bow thruster, Seakeeper Gyro stabiliser underwater lights, B&O TV and Sound System, Williams 385 Turbojet Jet Tender. The boat is powered by a pair of MAN V8 1000Hp diesels on shaft drives. The interior is finished in a beautiful gloss Cherry wood. 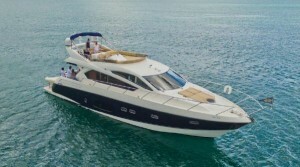 This boat has 4 guests cabins, two doubles and two twins, along with a twin crew cabin. The full beam master cabin boats a Kingsize bed and luxurious ensuite bathroom.